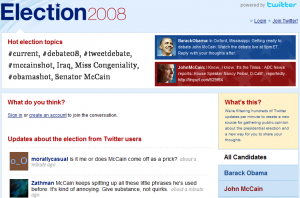 The launch of the New Election 2008 site customized by Twitter has come at the best time ever. It was launched on the eve of the first Presidential debate between Barack Obama and John McCain. This new site will be showcasing how Twitter can assist other major events and brands get real time brand recognition and market research. Lets look at what Twitter’s new venture could do for sporting events like what just happened with the Beijing Olympics (Olympics.twitter.com) or for the those who are watching an event I am passionate about in baseball with the World Series (worldseries.twitter.com) Those who watched the last Olympics would have a place to discuss all the different meets, medals, victories and defeats. Major League Baseball could use Twitter to have their fans keep track of playoff scores and real time play by play for our favorite teams. How about one of the most watched sporting events in the Superbowl (superbowl.twitter.com) The NFL could have real time forum of fans that who would love to get a chance to dialogue with their favorite teams, players and coaches. Popular television shows like NBC’s Heroes (heroes.twitter.com) and new shows like CBS’s The Mentalist (thementalist.twitter.com) could build even more of a following for their fans who have a passion for talking about what happened and what will happen next on their favorite show. Last but not least this new customized Twitter site could be used to launch a new product or service. Think of Twitter launching a product that you want to get out to the marketplace (yourproductname.twitter.com) All those who want to purchase your product could get instant access to satisfied customers already using it. You could also get automatic feedback from those who might be having a problem or have a suggestion on how to improve your product. You then get to monitor and then utilize some of the praise comments for future marketing efforts. Twitter would finally then have a way to generate some decent revenue with each customization. They could even offer this to the same Fortune 500 companies (Walmart.twitter.com) that are currently missing out on what Twitter has to offer. My only hope is that they also make this customization affordable for smaller businesses and not price it out of the stratosphere. Let me know your thoughts on the matter at hand.